Congratulations to "Mandy B. ", the winner in Austin's giveaway. Thank you to all who participated! When I started out writing—oh, back in the stone ages of the 1990’s—I was hooked on westerns. (I will not reveal just how old I actually was at the time.) I loved cowboys, ranchers, Old West gunfighters, but the best parts of those books I chose were the strong female characters. Some of my favorite books the heroine was the lead and she called the shots, sometimes taking the shots, too. I started dabbling in writing my own westerns, and of course, a woman led the way. In fact, I’m rereading some westerns that had women as gunfighters, avenging the deaths of a loved one. I forgot how much I loved westerns, and realized now why I saved those books. Fast track to my first published book, and the strong female character from The Degrees of Darkness, who wasn’t about to let no man treat her like a damsel in distress, even if he could sweet talk the wings off a butterfly. Cody Lewis was all cowgirl and had the backbone of many of her Western ancestors, but she was still, at her core, a woman. Her series wrapped and I moved on. Enter the women of McIntire County. And a niche was started—for me. When one hears alpha, we tend to think more toward the males, but females can be alphas. The Rivers sisters, of Atonement and Born to Die were raised by a Marine general, so they came by their tough demeanor and strong will naturally. In a lot of cases, you could say, that Nic and Cassy tend to circle each other in terms of territory, but blood is thicker in this case. So when I began writing Sins of the Father, I knew newly minted deputy Jolie Murdoch had to be different than her predecessors. She’s not all wibbly-wobbly, she is the daughter of the former sheriff, but she took a beating in Born to Die, and her confidence took a huge hit. She’s got a softer edge than Nic, and is more of a wide-eye dreamer than Cassy. As Jolie gets tangled up with the hero, Xavier Hartman, she begins to find that confidence she lacked as he schools her on the ways to assert herself, and defend herself. By book’s end, the Jolie we met at the start of the book is gone, and in her place is a character that fits the role of Alpha female. 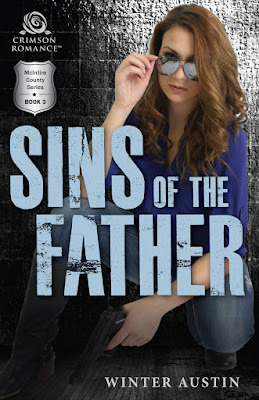 Winter will be giving away 1 digital copy of her latest novel, Sins of the Father. Such an intriguing excerpt! Please count me in! Congrats on this release... it sounds really good! Thanks for sharing! This book looks absolutely fascinating to me. I hope I win. Would love to read it! !